Measuring the toggle switch's threaded section with a caliper, it was about 11.76mm . 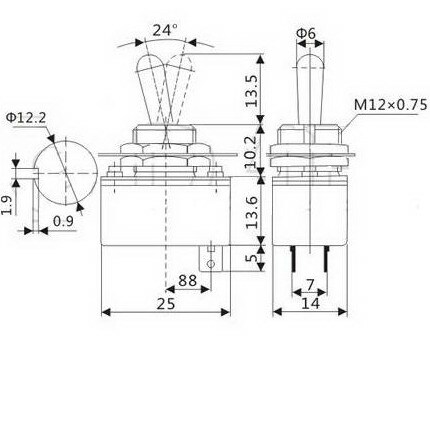 What's the dimensions for the mounting hole? Is there a datasheet anywhere? Also, these are so cool that I want to buy 5. I don't know what I'll use them for, but they're just that awesome. It's 12.2mm hole. It is shown in the Dimensional Drawing, but that may have been added after you asked your question. It is intended to be used in a 0.5" hole. 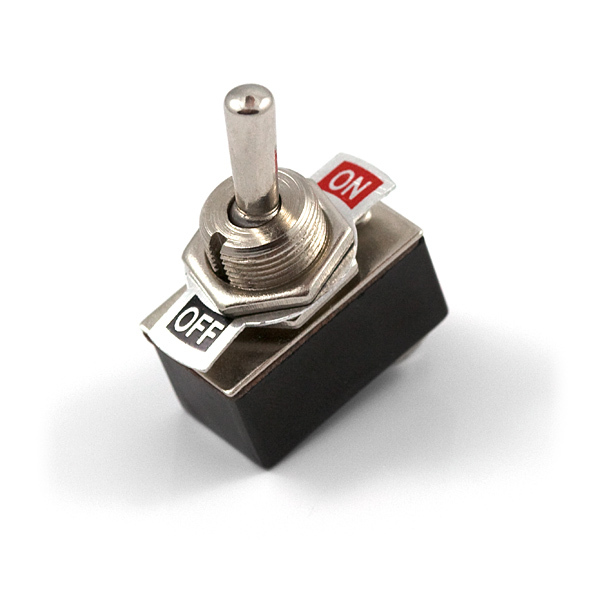 Does anyone know where to get an spdt version of this switch? I have 5 of these because I was dumb and ordered more than one, which would have been enough to tell me that the production quality is not the best. I tried using it with the missle switch cover, and the nut strips before it actually is anything resembling tight. Not the highest quality I've ever seen, but for less than two bucks, what did you expect? how many leads are on this? 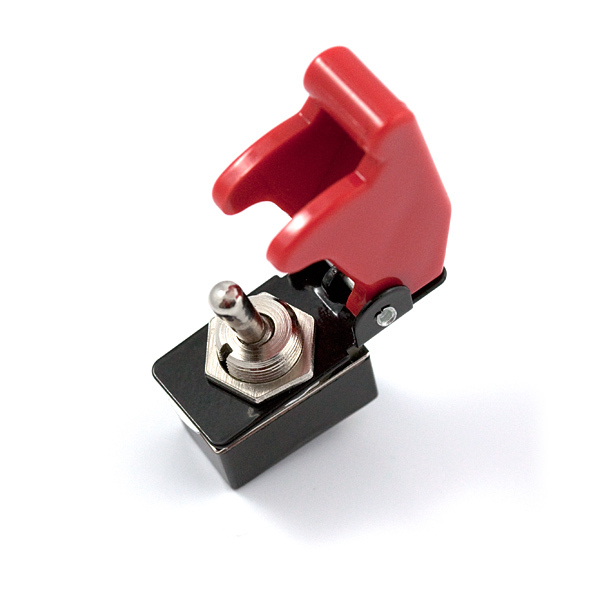 Are these as serious and heavy duty as the Toggle Switch and Cover, because I bought one of those and I actually can't use it much because it needs such a solid mount. 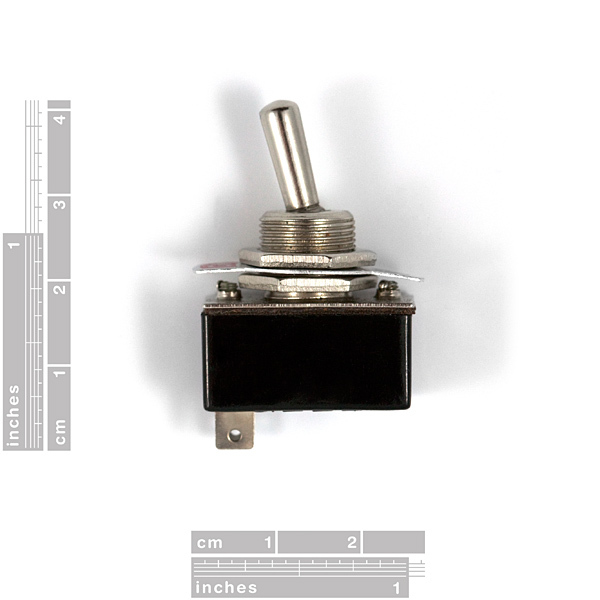 Does the handle condom COM-11146 fit this switch? There's no toggle switch with 2 pairs of prongs? 1, 3, 4... but not 2?! It's much better to have too many than too few. You can always ignore the extra poles if you don't need them. It's not what one would normally think of as a PCB-mountable switch, so it's not in the Eagle library. The connections are meant for spade terminals, and you can also solder wires directly to them. Is this switch Rated for AC or DC or both? These aren't waterproof are they? Anyone know where I can get some good waterproof switches/pushbuttons? I doubt these are, but a google search would help. Hehehe using this for the master power for my heated build platform for my makerbot!!! If you get the missile switch cover, you can't screw it on like in the photo, but rather the base of the actual switch (the top of the screw) should be flush with the upper hex nut, while the lower hex nut secures the switch to the cover. That way the missile switch cover doesn't bump into the screw area of the switch. If you use the Missile cover, you cant use the On/Off plate show in the picture, not a big deal. You can go a few mm in thickness, the missile cover, nuts, washer take up some space, It will easily go through 3-4 credit cards thick. How thick of material can this be mounted in? Does using the cover with it change this? Frankly the nut is crap, and will strip if you so much as hand tighten it too hard. But you get what you pay for, etc. I must have gotten a bad switch. The tabs on the back where you wire it are loose, not sure if that is by design. I wired something to it and it doesn't provide constant power, something inside is loose. It doesn't matter if the switch is on or off power will still flow through it intermittently. Cannot use, will attempt to replace and see if replacement switch also has loose wiring tabs. I opened my box , which contained this, along with many other parts, and with tradition, I tested it right away. Here's where the problem started, the switch wasn't making the clicking sound I expected, and wasn't making any contact. I think I got a bad switch. Sorry to hear that. If you'll contact our tech support team, they should be able to help you out with a replacement. I've purchased several (6+) of these over the last while. Haven't had a bad one. The terminals are loose, as one commenter mentioned, when the switch is in the OFF position, but they stiffen up in the ON position. Switch works great with a very satisfying "click", but the nuts and threads are cheap and the dinky ON/OFF panel display will never actually be properly straight. I accidentally shorted one with a high powered battery (30+ amps), and it failed open. No external damage, no fire.